What are the Top 5 Reasons Parents Buy Them? 9 out of 10 shots of your children are a blur of long distance shots - they never slow down EVER and you never seem to catch up for a good photo. The camera you just pulled out has struck terror in his or her expressions! Your most precious picture-perfect moments are slanted, off-center and often out of focus - from juggling keys, whistles and other attention-getters while trying to simultaneously hold on to the camera and snap the pic. Still other precious moments end up looking like the top half of America's Most Wanted - GANGSTA FROWNS. Time To Put Taking Photos on "Auto-pilot"
All kidding aside, you realize that there are a few challenges to overcome before you can consistently get the kind of top-quality images of your kids or family members you want without the trip to a studio and hoping you've caught your subjects in a good mood even if you do go. And that's where the right photography game will come in. Props have been designed for a variety of purposes since the advent of the camera. Some, such as simple costumes and backgrounds, mirrors and play items, all add ambiance to the photo. Look around your house for a child's favorite hat or scarf. Stop in at your local all-purpose store (like Target, Wal-Mart, or the Ma and Pa down the road) or raid your closet for fun glasses, mustaches and hats. Playing dress up is a timeless way to make it fun to smile for the camera. Every time you take your camera out, you are hoping to capture a "look" in several shots for posterity. And what I mean by the "look" is that perfect smile, amid sun-dappled cheeks, and clear, vibrant eyes with natural and un-forced expressions. To get that look requires some practice with your camera settings, but you need something to hold their attention. Gather some Props in all shapes and sizes. But there's also a very unique playing field for taking photos together and it is just new to the market this year, that's worth checking out. It's called the SnapShotz Photography Board Game . It's the simplest of solutions to that age old problem of how to get kids and "photo allergic" family members to "smile for the camera" when they least expect it. 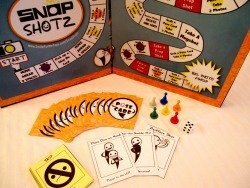 So grab some photography props and play the SnapShotz Photography Board Game. It is a seriously fun way to take photos.